To launch a lifelong contemplation of the vibration of Beauty and its potential for healing the individual and the community. To begin to develop the spiritual practices and practical skills to live harmoniously with all of life as it is unfolding. To nourish those who intend to be a healing presence in the world today. The Walking the Beauty Way Retreats gather a circle of souls who are intent on bringing more Light into a world that seems to be getting darker. You will be able to pause and refresh your spirit through an in-depth contemplation of the Neter of Beauty. (In SoulCollage®, Neter means energy or presence.) We will explore the Neter of Beauty’s potential to restore balance and harmony and to facilitate change in your inner and outer worlds. Both new and seasoned SoulCollagers are welcome to this time of quiet renewal. You can expect a delicious mix of the hands-on creativity of SoulCollage®, the quietude of meditation, and grounding in some practical skills to carry you forward after the retreat. Surprises, Synchronicities and the Sacred will enliven and enlighten your Soul. Plus you will delight in the joy of shared ritual and soul stories. At the heart of your retreat is the creation of a work of art, your personal expression of the healing power of the Neter of Beauty in your life. The only thing needed to make this art piece is your trust of the process, your trusty pair of scissors, and some special images. All other materials will be provided. At the Walking the Beauty Way Retreat you will find support and nurture in a community of ones who, like you, are called to share their heart-lights. Perhaps you’ll discover a new sense of hope and possibility about your own power to change your world. In addition, you will receive a Walking the Beauty Way Toolkit that will be useful after the retreat. The Toolkit will ground you in the practices of SoulCollage® and Meditation. It also includes coaching on the use of Harmony Self-Promises to help you stay focused in your daily life as you continue to bring beauty and harmony into your world. And for those who wish to go deeper after the retreat, there will be the option of joining the Walking the Beauty Way Practice Circle. There you will have an opportunity to give and receive support from the Walking the Beauty Way community and receive coaching on how to master the skills and practices provided in the Walking the Beauty Way Toolkit. In the summer of 2016, my thoughts and emotions were headed toward the abyss as I observed the enormity of our world’s conflicts and the breakdown of civil discourse in the United States of America, my country. My mind was filled with worry and overcome with dread about the unique difficulties my grandchildren will inherit. Vowing to keep myself sane and balanced, I resolved to return to my familiar contemplation of the Nature of Beauty. Putting my attention on Beauty has been a primary practice since childhood. When I do, everything changes. At a young age, I knew that Beauty is a human need. Beauty is a tonic. Beauty is good for what ails you. As a young adult, during many years of working among the desperately poor, I witnessed the power of Beauty to heal broken dreams. I learned that Beauty is an elixir for the body, mind and spirit. So that summer of 2016, noticing that others around me were also struggling with the same concerns, I was inspired to create and teach a year-long course called Walking the Beauty Way. Beginning in January 2017, my students and I created a circle where we committed to an in-depth exploration of the Neter of Beauty. Because Walking the Beauty Way is all about creating more harmony in our lives, we practiced meditation, SoulCollage®, and action planning. The year-long course and now, the Walking the Beauty Way Retreat, are the culmination of lessons learned over four decades from many wise teachers. I have incorporated those wisdom teachings about what is required to climb out of the shadowy abyss and remain calm—practical lessons about keeping one’s balance in difficult circumstances. Today, more than ever, there is a great need for more harmony and civility, inside of us and among us. We humans need to cultivate resilience and the inner resources to meet the painful challenges we encounter in life. We need supportive communities to help us get through hard times, to share our experiences, and celebrate our changes. We need rituals and practices to make meaning of it all. Nearing my 70’s, I join a growing flotilla of LightBearers carrying hope and possibility to struggling souls. I feel called to offer the teachings of Walking the Beauty Way as my small part in response to those needs. I am committed to support those Healers willing to bring the vibration of Beauty into the world. I invite you to join me by coming to the retreat or by sharing its message with friends. WHAT IS THE BEAUTY WAY? The “Beauty Way” is derived from ancient indigenous wisdom that a life without Beauty is soul-crushing and toxic for the mind and body. To Walk the Beauty Way means to live harmoniously with all of Life—with our own self, with our loved ones and with our communities. Clearly, a task that requires much awareness, community support, spiritual practice, ritual and ceremony! The Walking the Beauty Way Retreat is an invitation to begin a lifelong contemplation of the essence of the Neter of Beauty. It promises to begin a dialogue on what it would mean for you to live in harmony with all of Life—with your own self, with your loved ones, and with your communities. It promises you practical tools and practices so you are grounded as you live in harmony with all of Life. It asks you to consider how you would walk the Beauty Way when you return to your daily life. "Walking the Beauty Way course provides both a deeply spiritual approach to lifestyle change as well as specific “how-to’s” for daily life. Marti’s skills as a facilitator/mentor are firmly grounded in her own spiritual discipline. Her preparation and presentation always includes thorough background information, a creative assortment of tools and materials, along with the flexibility and willingness to tailor the class to specific needs as they arise—a winning combination! I know I will continue to use the practices I learned as I move forward in life." "Walking the Beauty Way has shifted the way I am experiencing my own life journey. As someone who’s always struggled to balance the many areas of my life, I find this level of SoulCollage® work pulls a lot of my pieces together. The Walking the Beauty Way course has helped me thread together where I’ve been, where I am now, and envision where I’d like to be going. The work has shifted my perspective, effectively shifting my reality." In October 2007, Marti was fortunate to train as a Facilitator with Seena B. Frost, the birth-mother of SoulCollage®. 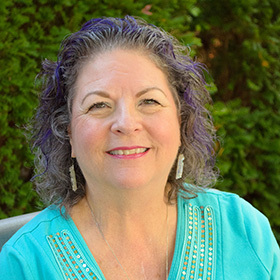 She has served the SoulCollage® community as Associate Editor of the Neter Letter and contributed to several writing projects including the e-book, "Seena Frost Answers Questions About SoulCollage®." In 2011, she served with Anne Marie Bennett as Co-chair of the SoulCollage® Facilitators Conference where she introduced the Circle Way practice as a facilitating tool. Marti and her Illinois peer circle support JoAnn Flynn, a Connecticut, USA Facilitator who ministers to women in prison. Marti also serves as Mentor/Coach to other Facilitators who wish to start their own peer circle or who want to use Circle Way practices as a container for their teaching. Marti brings over four decades of experience equipping hundreds of people of all ages and backgrounds to claim the inner and outer resources needed to be happy in work and love. She gracefully blends creativity, spirituality and practicality in all she does. Marti facilitates her SoulCollage® work in the sanctuary of circle where each person has the spaciousness to listen to and express their inner wisdom in the presence of respectful community. Marti’s greatest joy is encouraging others to know, do and be more of who they truly are, their SoulEssence. That is what makes for a more beautiful world! Lori Harris is an artist, butterfly farmer, and teacher who finds peace and guidance in nature. She raises and releases thousands of native butterflies with her community every summer. Lori’s artwork and community work inspire others to appreciate and care for the beauty in their own backyards. In 2015 Lori was introduced to SoulCollage® in Marti Beddoe’s Circle at the Westmont People's Resource Center, and has studied with her ever since. She finds the process of working with images quiets all the distracting noises, internal and external, allowing a more authentic narrative or story to emerge from the card itself. Lori often redraws her SoulCollage®cards in pastel when she feels they have more to teach her. FOR MORE INFORMATION: please complete the Contact Form and Marti will be in touch as soon as she is able.